Kodak Lakes are two drainage lakes adjacent to the now redeveloped former Kodak factory. The lakes offer very good fishing for anglers of all abilities. For younger or more inexperianced anglers the large amounts of small fish almost gaurentee bites when fishing with maggott. There are however, many Carp, Bream, Perch and the occasional Tench and Golden Orfe that can often take anglers by surprise. 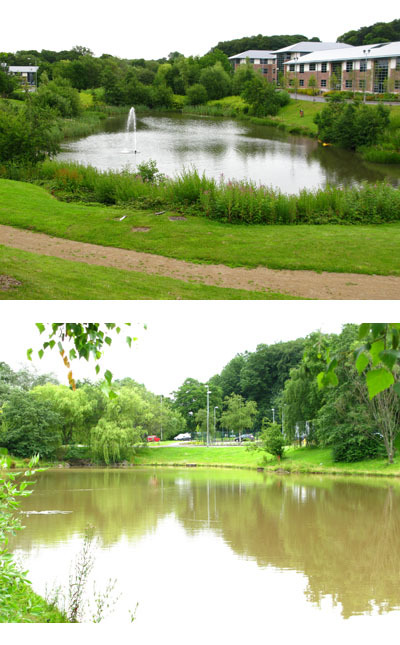 The Lakes are very well maintained and Landscaped and although in the middle of the Sherwood Enterprise Park are a very pleasent place to fish. The water is relatively shallow and the banks are quite flat making them the ideal place to teach Junior Anglers. The venue is for Members Only and Night fishing is not allowed. Parking is available on Lakeview Drive. Under no circumstances must cars be parked on the road on the far side of the ponds leading to the office car park. No Closed Season, Open all year. From Hucknall continue North along Annesley Road and onto the A611 towards Annesley. From the A611 Roundabout continue for 2 miles to the Traffic lights and turn left towards the M1 (J27). At the next roundabout turn right and then left into Lakeview Drive. The Lakes are on the left after 500 Yards.